Sieve the dry ingredients into a bowl and add margarine and rub it in with finger tips until it is the consistency of fine bread crumbs. Make a well in the center of the mixture and pour in the buttermilk. Mix to a soft dough adding in more buttermilk if necessary. Turn out the dough onto a floured board and knead until smooth. Place the dough on a baking sheet and make a cross on the top. Bake in a hot oven 425 F for 45 minutes. As an alternative it can also be served with butter and strawberry jam. 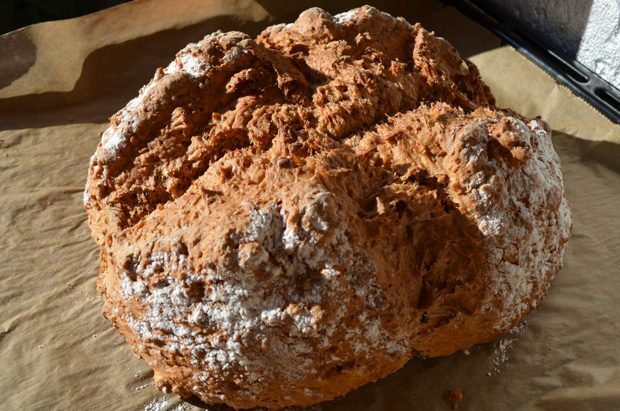 This bread is popular throughout Ireland. Because it is easily and quickly made it is often baked fresh for tea, or for breakfast and it is also served with soup. As it is not made with yeast, you can have it ready in an hour to service on the table. Restaurants in Ireland traditionally serve it with soups.